An ancient fort and the city of Bijolia are situated 19 km from Menal and 48 km from Bundi in Rajasthan on the Bundi Chittaurgarh road. 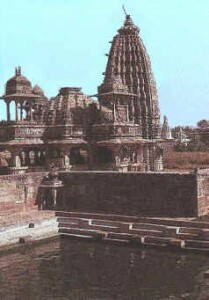 A high paved courtyan on the side of the fort has a large temple of Lord Shiva in its centre with a fine image of Lord Ganesha standing as a guardian at the entrance. A curved archway leads to the temple. Near by Mandakini, Kund is a holy water tank. This entry was posted in Bijolia, Rajasthan. Bookmark the permalink.